Driving Across the Canadian Border | how's it going, eh? 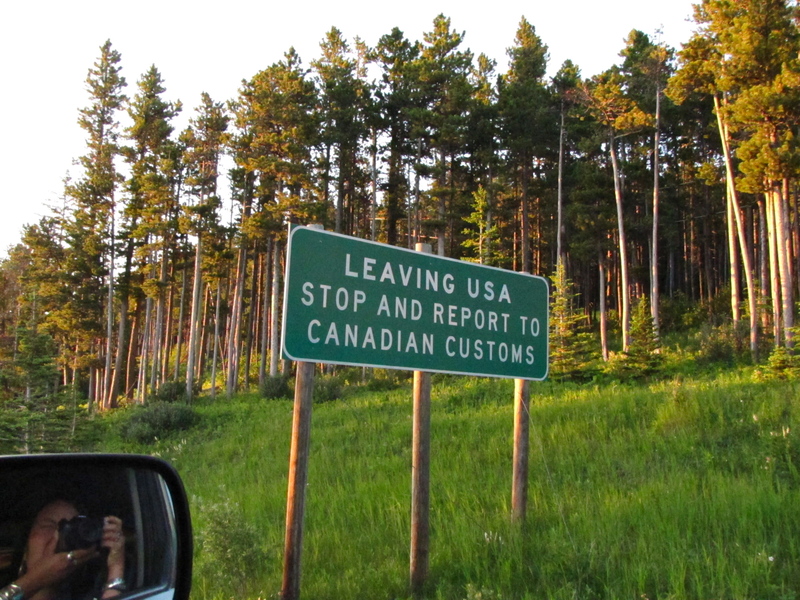 Last Thursday we drove across into the Canadian border, folks. I was as nervous as a young filly. Will they search our car? What documents will I have to fill out? Will they stamp “Hoarder” onto my passport? Will they turn me away???? 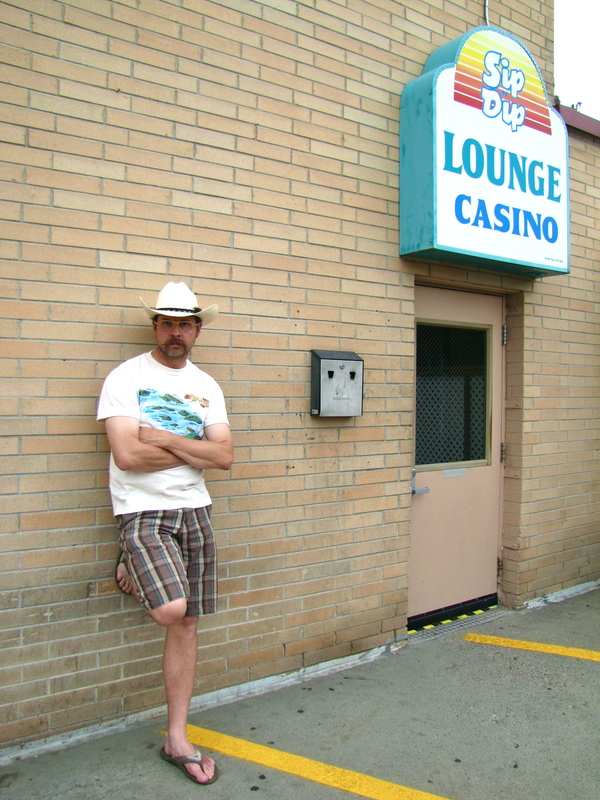 The day after Fourth of July we left our beloved “O’Haire Motor Inn”, but not without going into the “Sip ‘N Dip Lounge”. 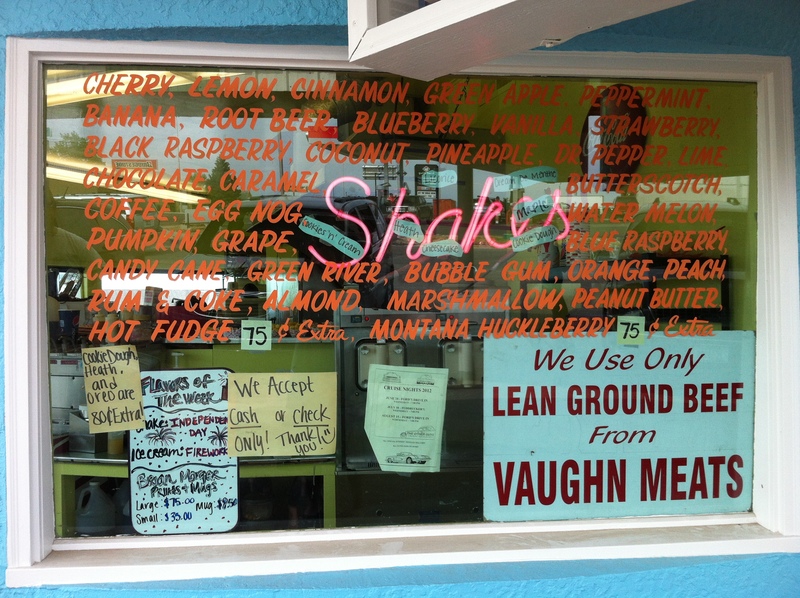 Our sole purpose for staying in Great Falls, Montana was the “Sip ‘N Dip”!!! We wanted to see those mermaids swim, darnit!!!! Swim, you mermaids, SWIMMMMM!!!!! But alas, mermaids were just beyond our grasp as they take breaks for national holidays. Crazy, mythical goddesses. Good for you, mermaids. You deserve it. This place is kitsch heaven! Here is the “tank” that the mermaids would’ve swam in. It’s basically their indoor pool that closes at 9pm when the mermaids perform. 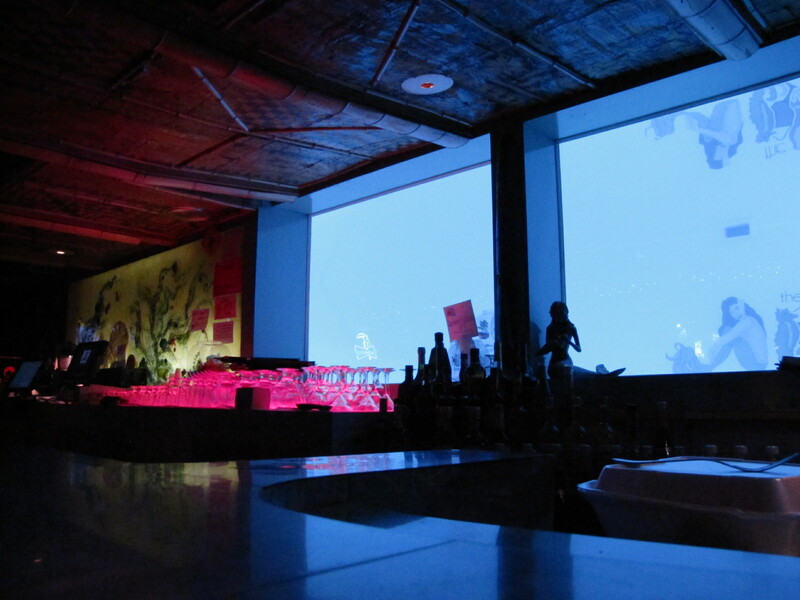 Harsh realities – mermaids get in a chlorine pool after all the hotel’s rambunctious children have sullied it’s waters. Dashing all romanticism. We could linger no longer. 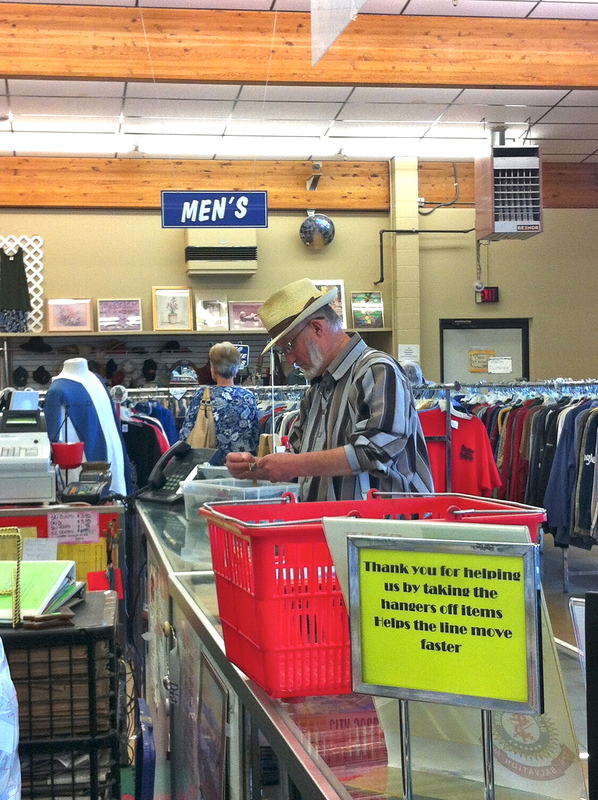 In typical Jeff + Shelli style we speedily ravaged a couple thrift stores before departing Great Falls. Oh man, it was heaven. 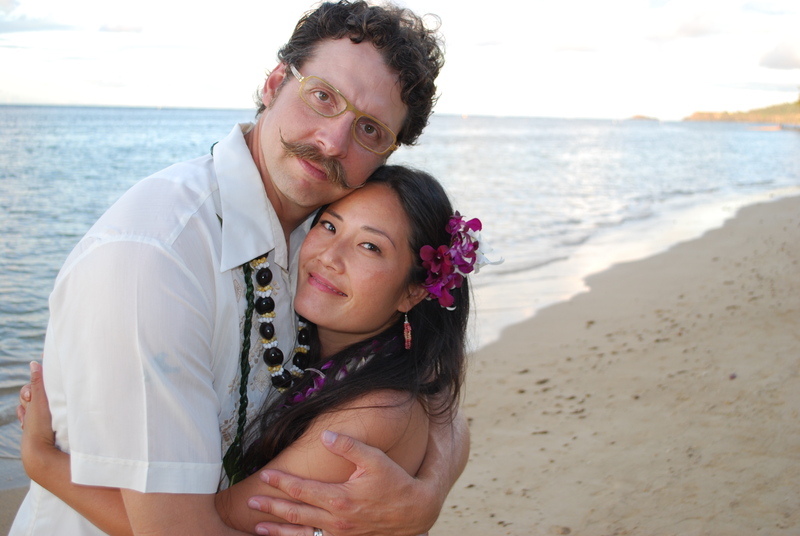 Tom + Deb (my brother + sister-in-law)!!!!! Avert your eyes!!!! I know you’re wringing your hands right now! Actually, Jeff was EXTREMELY restrained – I was really proud of him. Plus, there was no more room in our G-D car. Nevertheless!!! Who knew Great Falls was chock full of Hutterites!!!! I was so excited, my heart was palpitating. Hutterites are like celebrities to me! Nevermind the “celebrities” I see at work! As all my close friends know, I’m obsessed with Hutterites ever since my handmade moccasin encounter at a Calgary bar from this post. 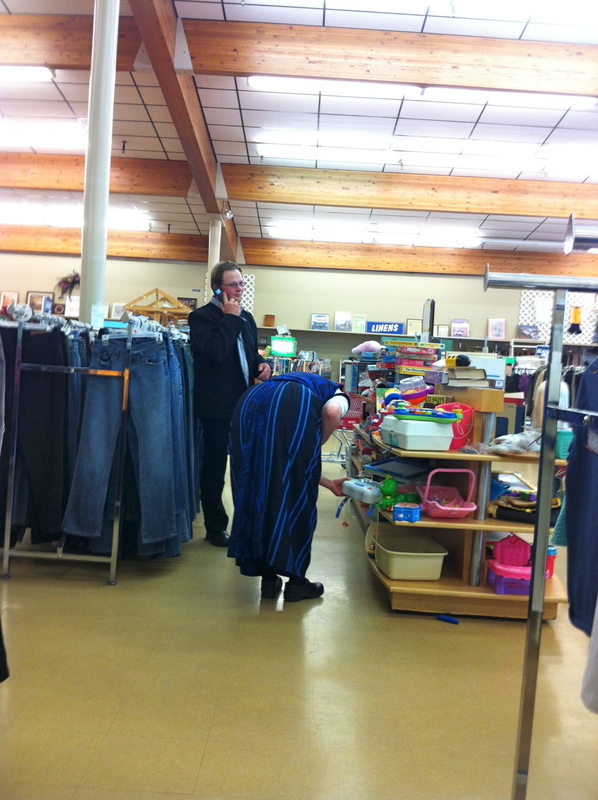 I took a bunch of spy camera (IPhone) pictures at the Goodwill. 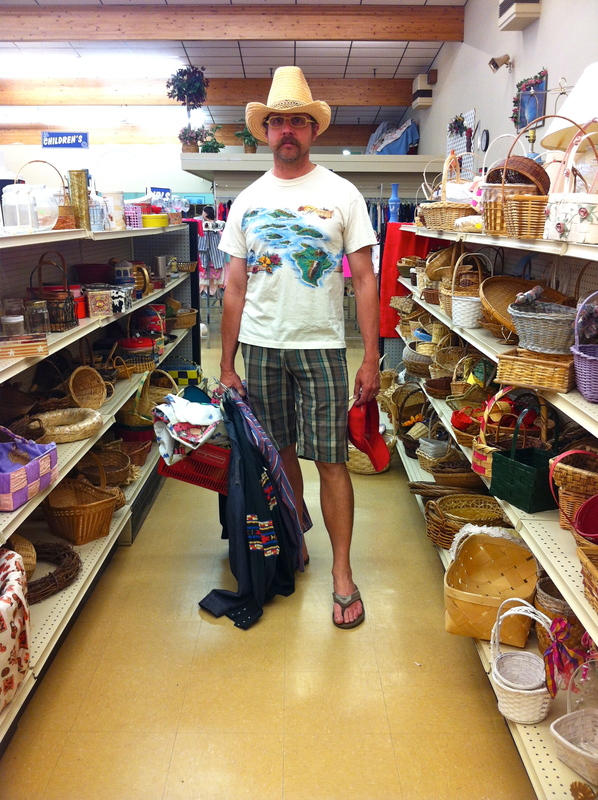 I call this photo, “Thrift Store Warrior”. Slightly frightening. Full of purpose. Ready to destroy. 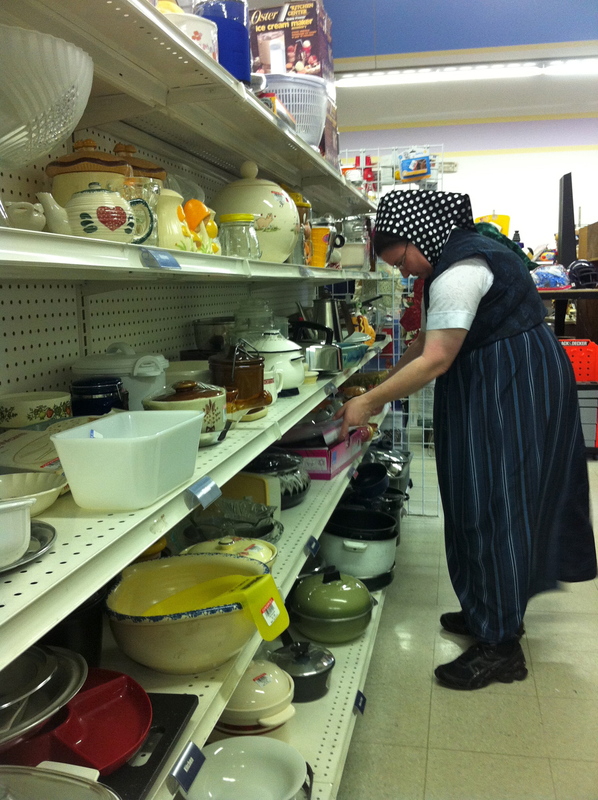 Okay, get this….there were MORE Hutterites at Salvation Army!!! This guy walked in + said to me in his thick Hutterite German accent, “Yooooo luuuk like reeel cowguuurrrrl.”. 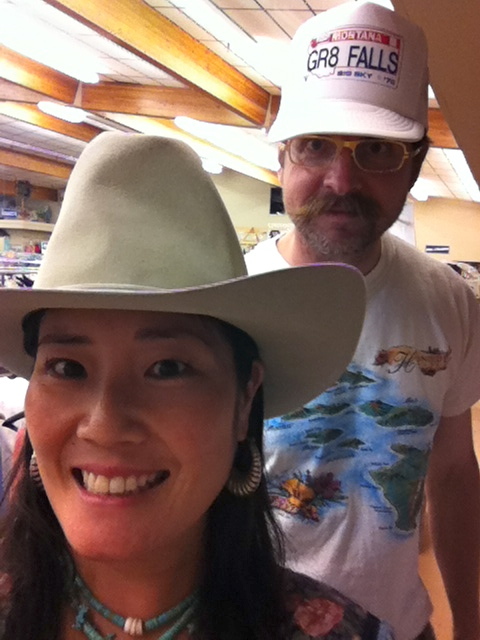 At first I forgot that I was walking around the store in a cowboy hat + thought he was referencing my cowgirl stat us to my muumuu. By the way, I observed that Hutterite men were almost always constantly talking on their cell phones + their clothes are surpisingly ill-fit. 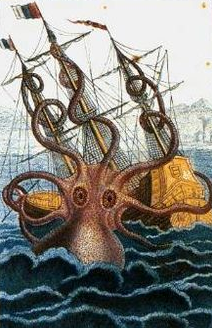 We had to get outta there or else the thrift store Kraken would have swallowed us whole. 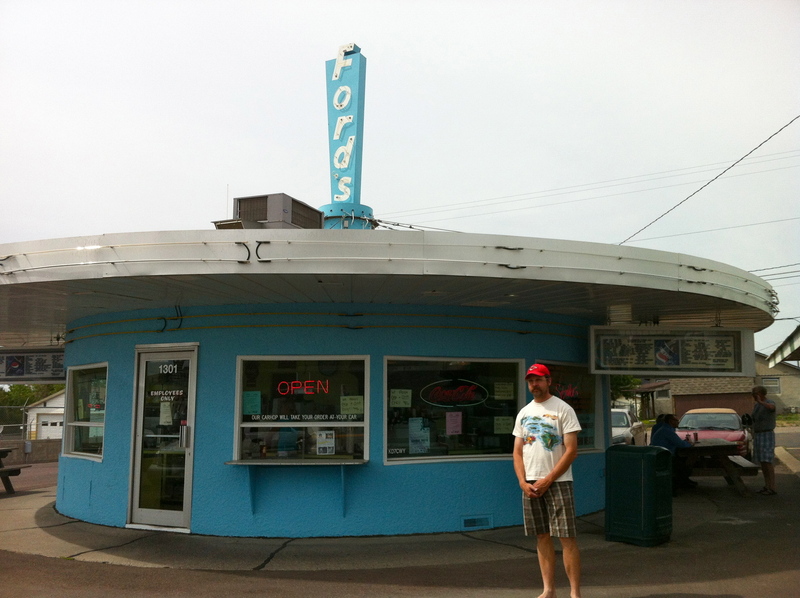 On our way out of Great Falls driving down the 89 Hwy, we spotted Ford’s Drive In with our beady eagle eyes + swerved in real fast-like!!!! Whatta gem!!! 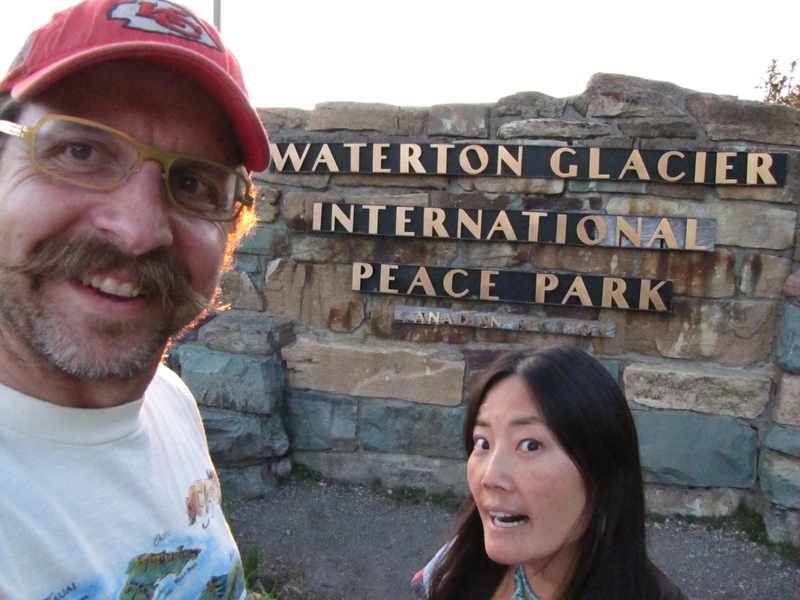 Like total tourist nerdberts, we got out of the car + oogled around. The sweet waitress said, “Oh, we’ll take your order from your car!”. 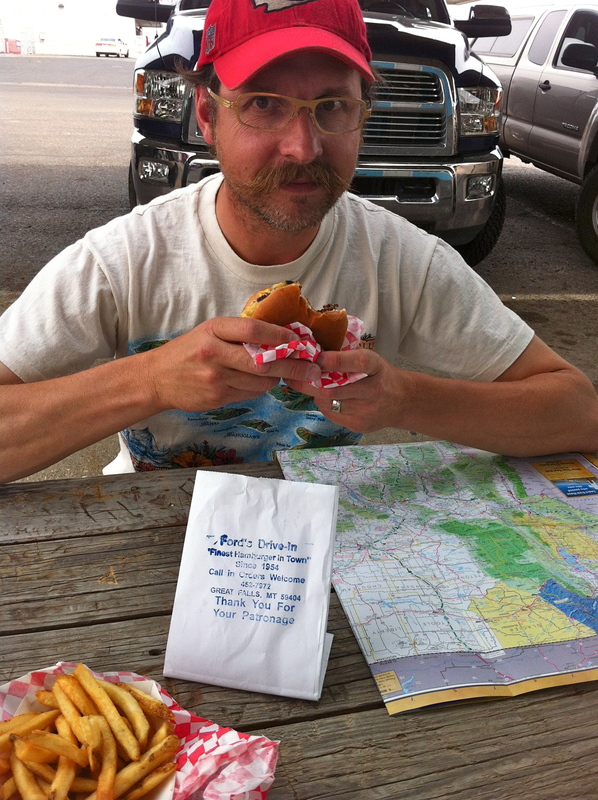 We thoroughly enjoyed our road trip fare. 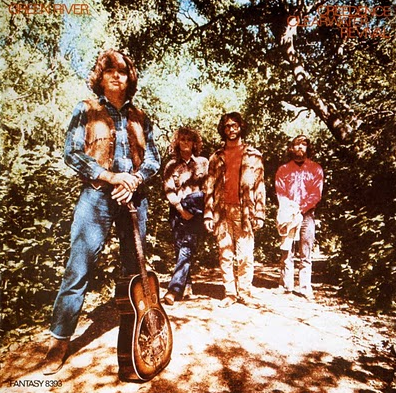 I ordered the “Green River” soda solely because it reminded me of the “Creedence Clearwater Revival” song + because I didn’t know what the heck it was. It was a toxic blend of Idon’tknowwhat. It was so sweet that I could only drink an 1/8 of it. 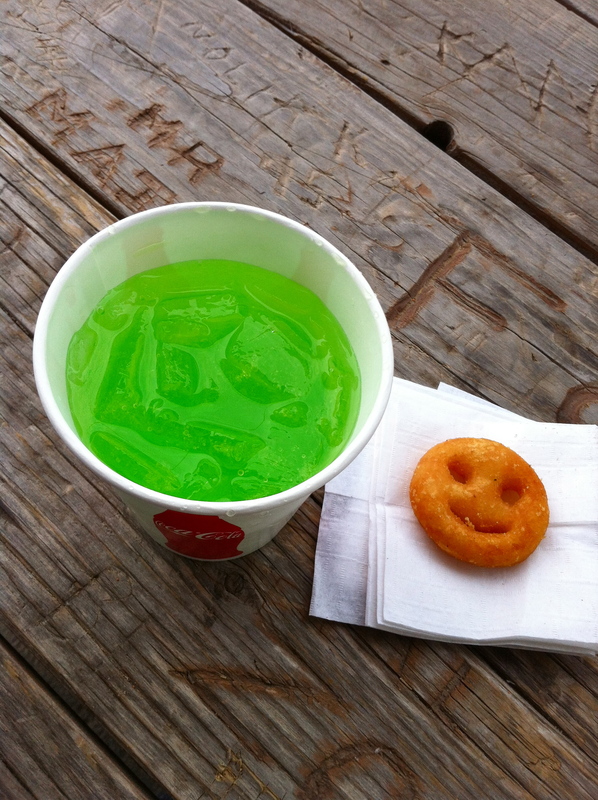 Oh, and we got a stowaway, smiling “potato gem” in our fries. How un-natural is that color?! There’s good ol’ CCR. An hour + 1/2 away, we stopped by the teensy tinsy little town of Dupuyer. 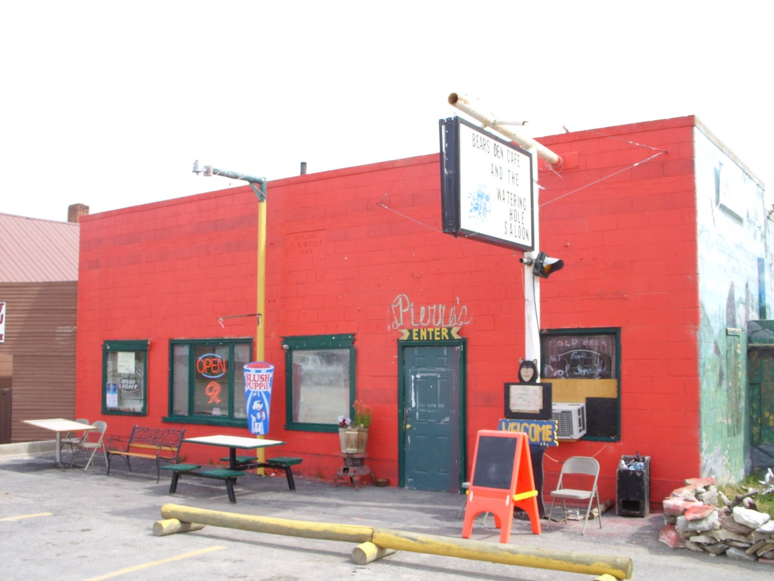 Jeff really wanted to go into this weird looking bar, “Pierre’s”. I really wanted to keep going but Jeff said, “C’mon Shells, it’ll be your last beer in America.”. Where do I sign up!? 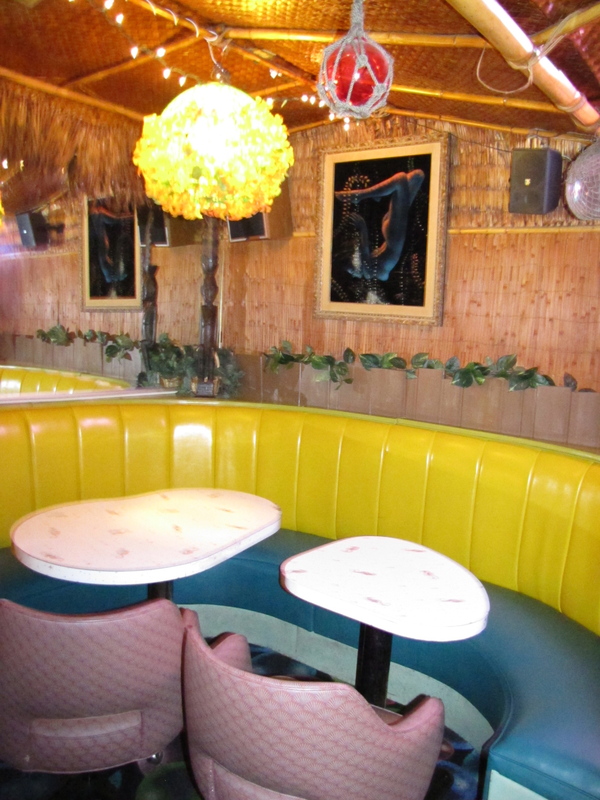 The interior of Pierre’s looked like someone’s living room. We were siting there chatting + the stoic guy at the bar asked the usual polite, “Where are you guys from? What do you do for a living?”. Montanians love to ask what you do for a living! We started telling him we both do costumes for film/television. Well, guess what?! His name was Pat Judge Hall + he is a stunt guy + is currently working on “The Lone Ranger”. 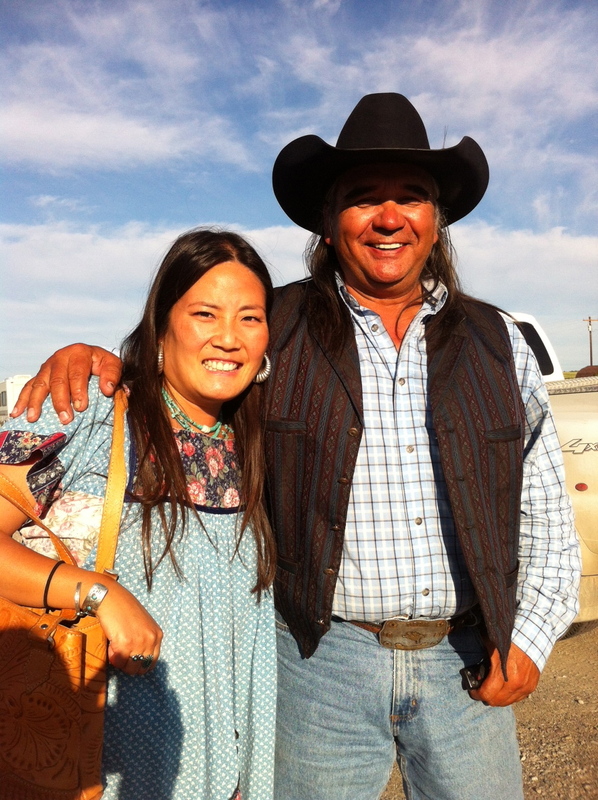 His past screen credits have included, “Cowboys + Aliens” + “Dances with Wolves” – he even knew one of my costumer friends from Los Angeles!!!! Totally small world! Dupuyer is seriously TINY, people! Oh, + his license plate read, “INJUNPWR”. So dope. I totally look like I’m in pain in this photo + Pat looks like a handsome film star. Another 45 minutes later we stopped for gas in Browning. 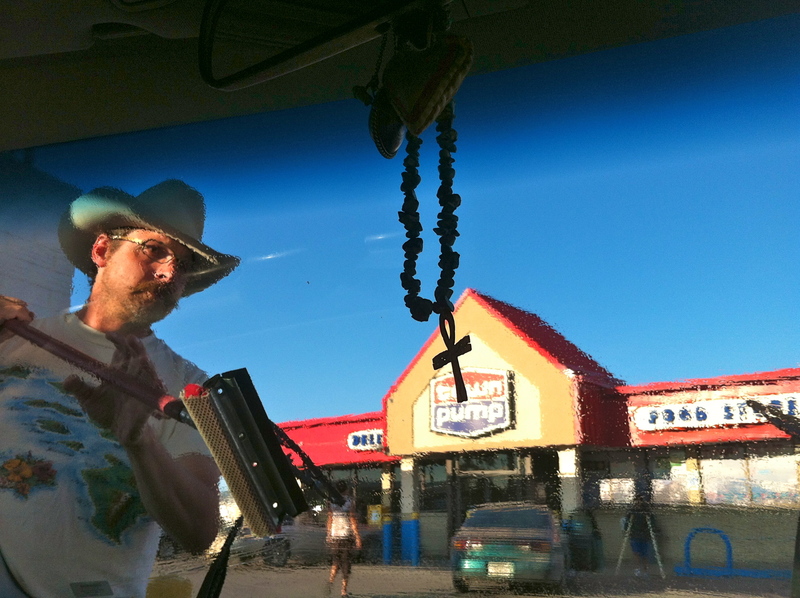 Here is a typical view of Jeff washing the windshield of multitudes of insect casualties. Yo, Browning had some rough characters, y’all! I definitely wouldn’t want to stay there overnight! 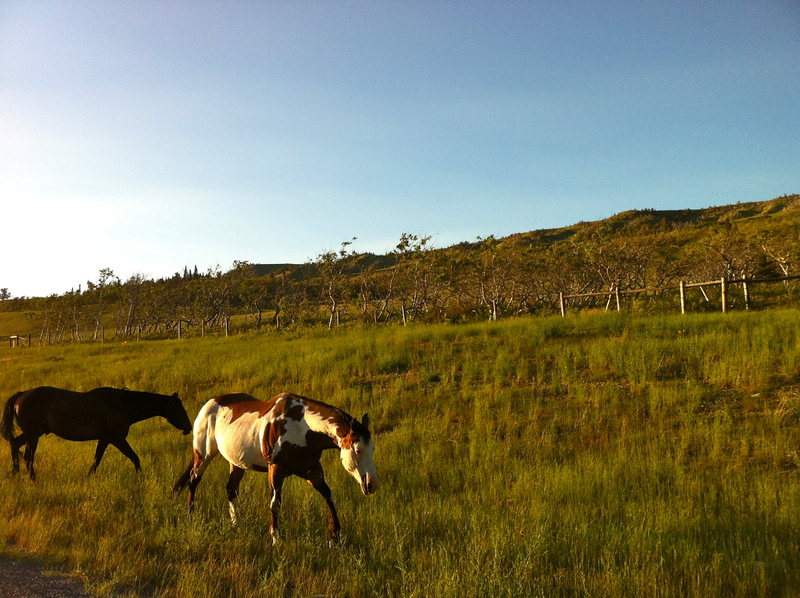 It is the largest community on the Blackfeet Nation. 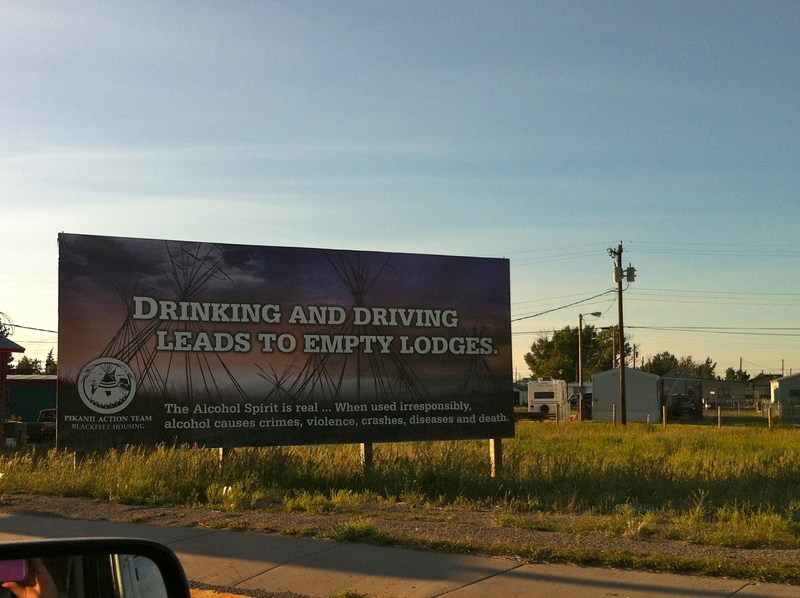 Here is a billboard you don’t see very often. Farther north along the 89 Hwy became “open range” territory. I was freaking out because of all the free wandering cows + horses! I’m from Los Angeles, yo – what the heck are these animals wandering about willy nilly! Border crossing at Chief Mountain!!!! 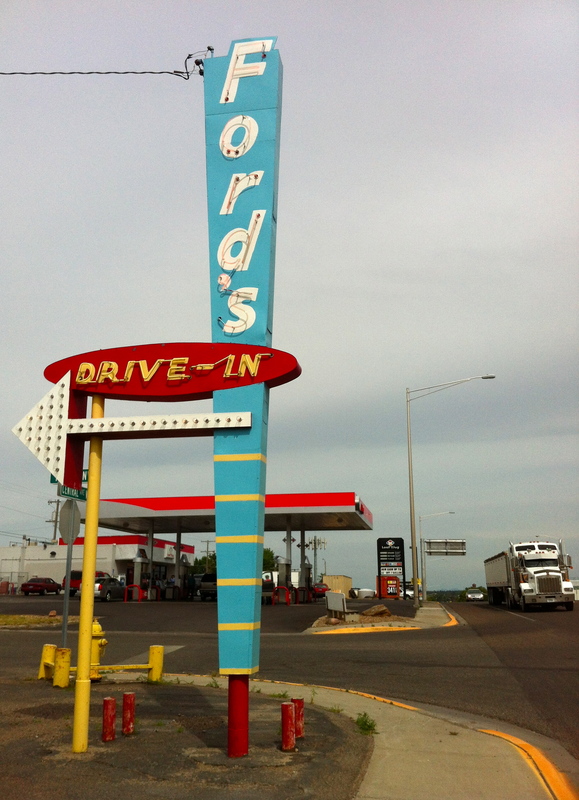 Oooooh, we were so amped up – we had never driven across the border together. And especially with the car packed to the brim!!! But I was prepared, y’all!!! I had our passports + IDs, car registration + insurance in my hot little hands! Plus, I had copies of our marriage certificate + documents that proved we were starting our immigration paperwork (i.e. copies of medical exam, FBI report etc.). After 10 minutes of questions, the customs agent waved us through! Without searching the car OR paperwork!!!!! We were SO RELIEVED!!!!!! Here we are on Canadian soil!!! HUZZAH!!!! I was so scared that after the 6 day drive we were going to get denied at the border + be turned around after all that driving. It’s not as trepidacious as we both thought it was going to be. As long as you are prepared, have documents in hand + are honest – you have nothing to fear!!!! Good luck fellow travelers to Canuck Land!!!! Surprisingly painless!!! Well… sort of painless. 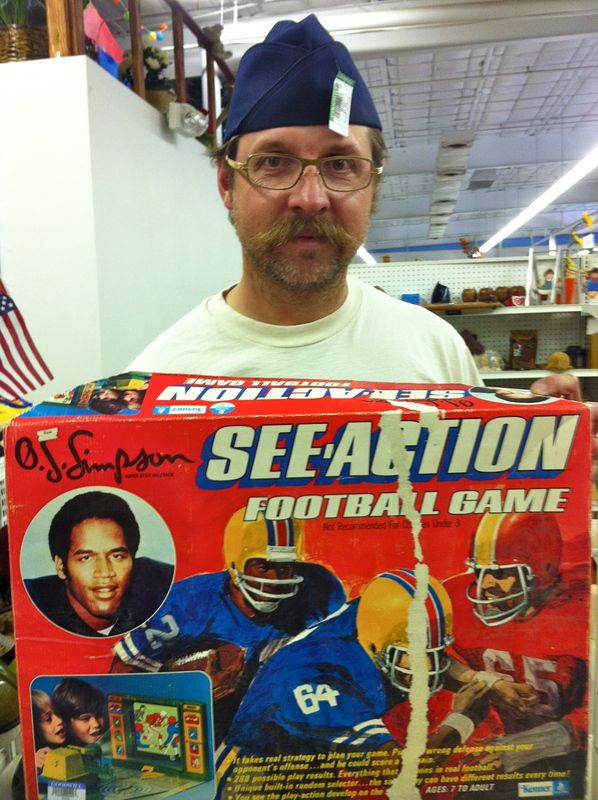 There’s definitely “additions” to all of our stuff – but don’t worry Deb, I’ve been studying my Ebay textbooks! Getting ready to sell!!!!! Thanks so much! I was sweating bullets, but it was easy as pie!!! I guess since the agent saw that we were prepared, he didn’t feel the need to investigate too much!